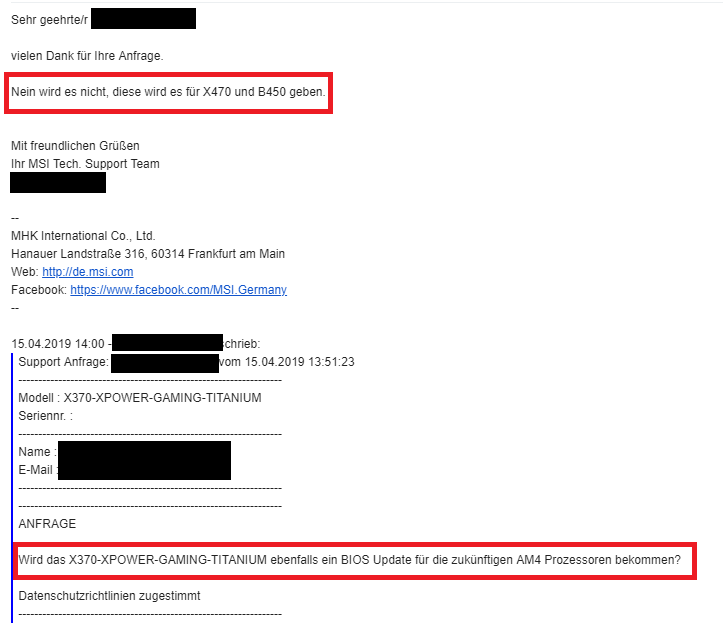 An email that has supposedly come from MSI’s German-language tech support team has stated that the company will not be offering support for AMD’s upcoming line of Ryzen 3000 Matisse desktop processors on older motherboards (300-series). However, there has not been an official statement from the Taiwanese company in regard to this issue yet. MSI has issued a press release stating there will be support for compatible 300-series motherboards. Update April 16: MSI has issued a press release that states that its tech support team misinformed the customer asking about X370 motherboard compatibility with next-gen AMD processors. The company is testing all of its AM4 boards, including those from the 300-series, and it will release a list of all compatible boards closer to Ryzen 3000's launch date. MSI will be releasing BIOS updates for numerous motherboards (see attached image below article) in May that will allow Ryzen 3000 compatibility, including for the X370 Power Gaming Titanium motherboard specifically mentioned. It seems trouble could be brewing for MSI if a leaked email between a customer and a German-language tech support team is genuine. 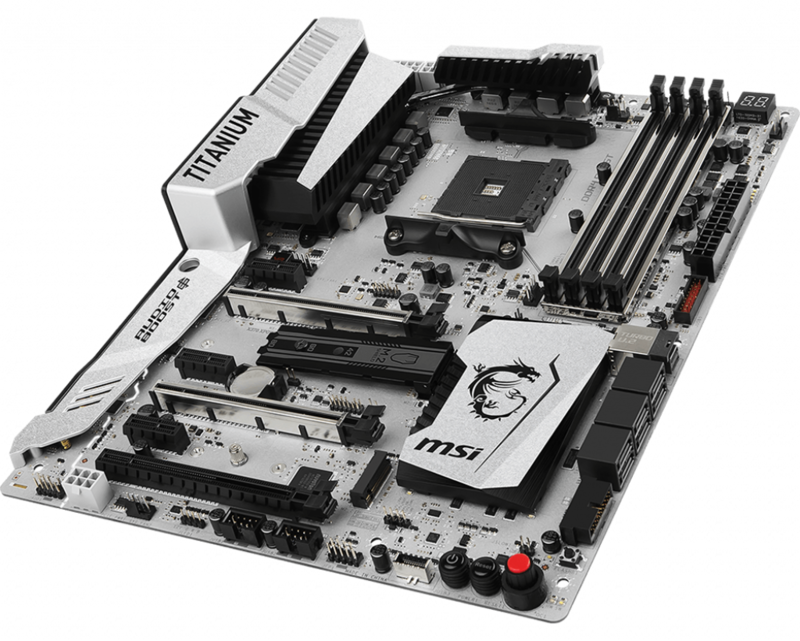 A curious owner of an MSI X370 Power Gaming Titanium motherboard, which has an AM4 socket, enquired as to whether the hardware would receive an update to allow it to utilize the upcoming Zen 2-based AMD Ryzen 3000 processors. The alleged answer has infuriated many. According to a translation, the reply was basically “no it will not, this will be for X470 and B450”. This would mean owners of 300-series MSI motherboards who wanted to upgrade to the AMD Ryzen 3000 chips would have to purchase a new (expensive) motherboard rather than enjoy a simple BIOS update. We reported on this possibility in March, when there was a rumor that B350 motherboards, which also have the AM4 socket, would not receive support. A few things have to be taken into consideration here: The email could be fake; the tech support team in question may be either mistaken or even not in possession of the company’s full plans in regard to Ryzen 3000; this situation only seems to involve MSI at present. It’s also not known how AMD will react, as the chipmaker committed to the AM4 socket platform until 2020, implying that all current boards with AM4 sockets would only require a BIOS update to be able to utilize new chips. Of course this business is down to MSI, not AMD. If the email turns out to be genuine and accurate, the company will likely lose a lot of customers who do not want to fork out on a new motherboard. There has been mention that the Zen 2-based Ryzen 3000 processors have higher power requirements that older 300-series boards cannot manage. No doubt, this will soon be proved right or wrong when the Matisse desktop processors finally get in the hands of computer enthusiasts.